You'll be £12.00 closer to your next £10.00 credit when you purchase Type 5 Heavy Freight Locomotives. What's this? This photographic album portrays the four classes of locomotives introduced to operate on the British Railways system, prior to Privatisation in 1994. Increasing loads and deteriorating reliability of older classes necessitated the design of new, higher horsepower classes of diesel locomotives to operate the increasing requirement to operate trains handling loads in bulk, such as coal, minerals, fuels etc. The four classes included one American design – the class 59 – which set new standards in haulage capacity and reliability. The other three designs – classes 56, 58 and 60 – were more suitable to their tasks than previous models, but in the case of the class 56, suffered a poor repuatation for availability for several years, although the few remaining members of the class have now attained acceptable standards. Of the four classes, a small number of class 56s operate in private ownership, all the class 58s have been withdrawn, but all the class 59s and 60s are in daily use throughout England and Wales. 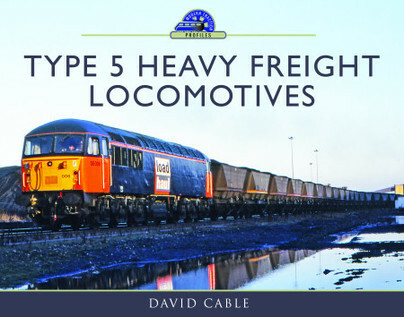 This album has been written by David Cable, author of a series of illustrated books covering railways in the UK as well as overseas. The book shows examples of all four classes working a variety of duties at a wide range of locations. The photographs are of excellent quality and are arranged by class and virtually in date order. This album illustrates well the improvement which was achieved in haulage capacity and reliability. David Cable (1929-2017) was interested in trains from a very early age, and this developed into an interest in train photography in 1947. David was the author of many photo albums, covering modern traction in the UK since the 1960s, as well as volumes based on his visits to other countries over the last 40 years. During his life he travelled throughout Europe, North America and Australia, as well as some Far Eastern countries and Morocco.